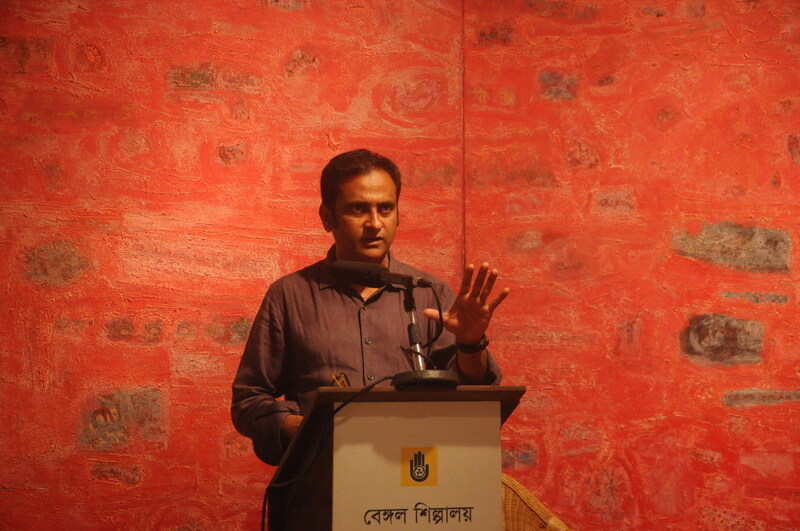 Expatriate artist Niamul Bari’s solo exhibition titled Momentary Histories is going on at the Bengal Gallery of Fine Arts in the city’s Dhanmondi area now. Marking the exhibition, the artist Niamul Bari spoke at Bengal Shilpalaya recently to share his experiences as an artist and his transition from a ceramic artist to a sculptor to a painter. Niamul Bari, born in Chittagong in 1966, completed his BFA in ceramics and MFA in sculpture from the Faculty of Fine Arts, Dhaka University, and received a higher diploma in sculpture from the Rabindra Bharati University in India. He has been residing in USA since 1988, and has had his works exhibited in USA, Japan, Nepal, Bhutan and India. He began focusing on paintings in 2008, and has brought a sculptor’s perspective into his works - using thick colour layers, textures, drawings and use of scrap to produce dramatic, intricate and meditative pieces of work.